My relation with Oman is one planned by destiny. Until I got married, Oman was just a place I had seen on the globe during my Geography class. But post marriage, Oman became a part of my life. My father-in-law has been working in the Sultanate of Oman for the past 23 years. His love for Oman is evident from the fact that he just refuses to retire and return to India. My father-in-law's first gift for me was a gold bracelet he picked up from Gold Souk in Oman. He might forget to carry his essentials back home in India, but never misses to carry my half yearly supply of the most delectable Khalas dates which are one of the best ones in Oman. Every year when he is back home in India for a vacation, he talks animatedly about the country, the countrymen and in particular the generosity of the Sultan of Oman. I sit listening to him like a curious kid as he narrates me stories of the mythical land of Oman... the rugged mountains surrounded by waters, the extravagant displays at the Gold Souks, the lavish lifestyles of the Omanis, the delectable and peculiar culture of Omani food and most importantly the respect and freedom that the country awards to its women. In fact I was surprised when I learnt that The Sultanate of Oman guarantees the freedom of worship to all its residents, irrespective of their religious beliefs. At present there are two Hindu temples, 4 Gurudwaras and several churches in Oman. As I sit before my Pa-in-law each year listening to him animatedly, a part of me always longs to see this place, experience its culture and soak in its royal hospitality. Beauty has a New address and it has Adventure, Royalty and Hospitality for company. My first stop Sultan Qaboos Grand Mosque. This is a gigantic and artistic structure constructed with 3 lakh tonnes of Indian Limestone. This mosque houses the second largest single piece carpet in the world.The carpet measures over 70 × 60 meters, and covers the the praying hall in a single piece which is 4,343 square meter in area. The relation of women and jewels need not be explained, and that is why Qurum Natural Park makes it to my list to to visit places in Oman, because this park is considered as the Jewel of Gardens in Muscat. The biggest attraction here apart from the migratory birds that visit this park is the Waterfall Hill which looks splendid during the night. Also you just cant miss the Rose garden in the park which is absolutely gorgeous with its huge variety of roses. 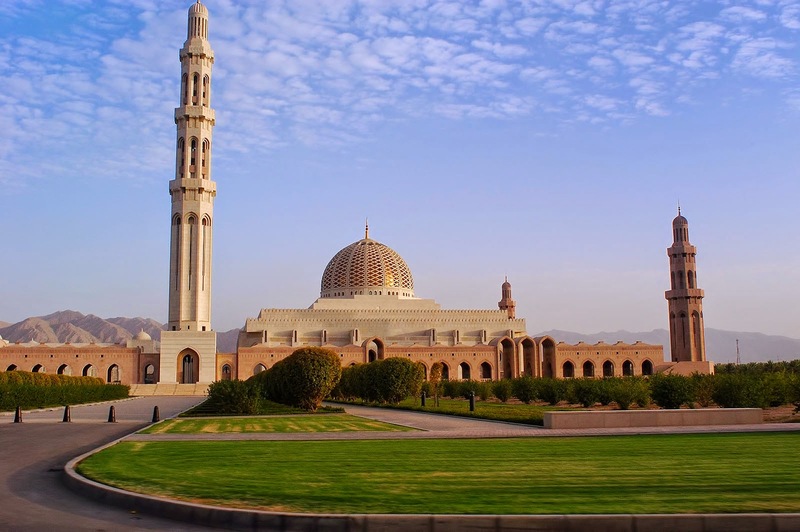 Oman is a culturally rich country and its contribution to world history, cannot be ignored. So, to study about the the history and culture of Oman, I would love to visit the Museum of the Frankincense Land. This place narrates the tales of the ancient port and the frankincense trade trail. Following the historical trail, I would love to visit the Nizwa Fort - Oman's most visited national monument which has immense significance in the long history of Oman. Like me, if you are the kind who likes to revisit and relive history, then a visit to the Sumahram Old City is a must. 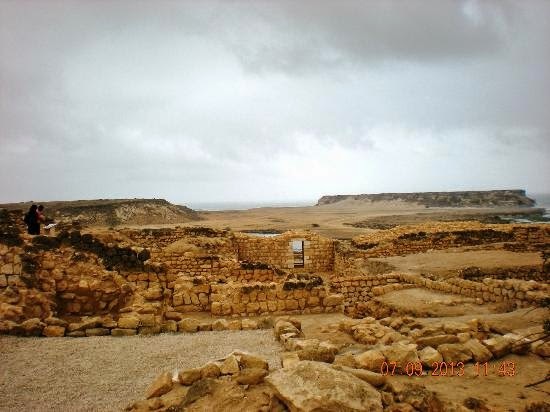 A delight for archeological lovers, it is believed that the remains in this city are as old as from the time of Queen Sheba. In the heart of the city is a small town called Khor Rori which is believed to date back to the first century CE. Another place that I am really excited to see is the Oasis village of Misfah. This village is a manifestation of a paradise in the deserts of Oman. The culture and lifestyle of this sparsely populated village is very simple and traditional, and is a must visit in your trip to Oman. One spot that I am really intrigued to see is the Earth Gravity Controversial Point. Whoever said Nature does not defy laws, had probably not seen this place. Be ready to be confused and surprised as you witness the theory of Gravity being proved wrong at this point. 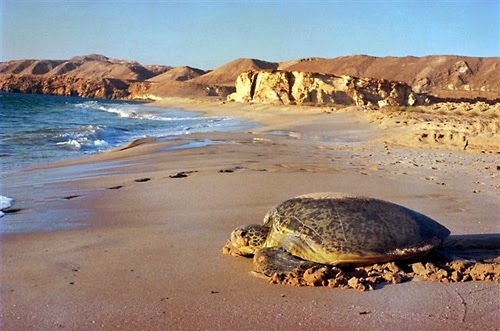 Every Year thousands of sea turtles travel to the shores of Oman to lay their eggs. Now who on earth told the turtles about Oman's hospitality? Jokes apart, it is quite a breathtaking view to watch different species of sea turtles on the Turtle Beach in Sur, Oman. If your timing is right, you can also witness the egg laying process of some of the largest turtles in the world. A sinkhole is a natural phenomenon and is a hole or depression that is formed in the ground due to collapse of the surface layer. But a local legend in Oman believes that the Bimmah Sinkhole was formed by the falling of meteor. 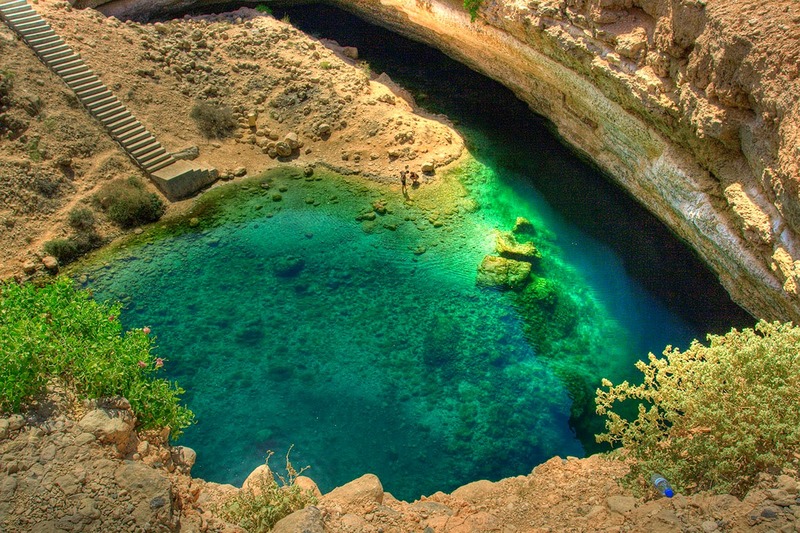 Flanked by rocky limestone filled with turquoise blue water, Bimmah Sink hole is nature's beauty at its best. Because I am a compete water person, I would like to dedicate an entire day on a Dhow cruise to explore the breathtaking fjords of Musandam. Learning about the history of Oman sitting on the cushioned carpets of the Dhow gorging on lip smacking food and anticipating the spotting of dolphins...gosh I am daydreaming already. Next on my list is Wadi Ghul. Ghul is Oman's answer to the Grand Canyon of America. Rustic, enormous, ancient and utterly gorgeous, Wadi Ghul is a natural phenomenon that awes you completely. And last but not the least, I would love to end my Oman trip on a high with some retail therapy. For that a visit to The Centre for Omani Dress is a must as it is one center that is firmly dedicated and committed towards the national dress identity of the Sultanate of Oman.The Muttrah Souk is a place where you can buy gold, silver, artifacts, perfumes and many other things all in one place. Oman is everything that will make you fall in love with it. And I can't wait to culminate my Love Story. P.S. I do not own images used in this post. Happy to know you are visiting....have fun girl...looking forward to more travel post! Wow! This looks like some place. And your father in law's stories must be awesome. Its great to be surrounded by people with tales to tell. With BullionVault you may purchase physical gold and silver by the gram at current spot exchange rates. Open your free account today and get 4 grams of free silver as a joining bonus.